Since I’ve come to the realization that I can make awesome flavored coffee at home with my completely normal drip coffeepot, I’ve been determined to find and purchase the fun holiday flavors to try. My current mission: find the best Pumpkin Spice ground coffee that I can afford! I’m beyond excited that Fall is quickly approaching, and I want my house to smell like pumpkiny-spicy goodness each morning when I wake up. Is that too much to ask? Nope. Nope it’s not. Currently, I’m considering ordering this one from Green Mountain Coffee. It has lots of positive reviews! 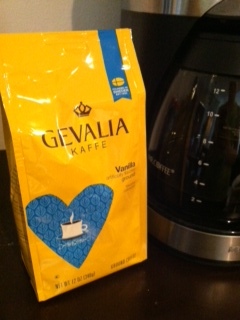 I’m sure lots of good flavored coffee options are going to pop up in my local grocery stores anytime now, but I’m impatient and want to know that my delicious smelling coffee is on it’s way asap! Google has been slightly helpful in this hunt, but a lot of good seasonal coffee flavors are not available yet for purchase. Sad day, I know 😦 But the anticipation of the season and all its wonderful flavors and smells is still kinda fun! It also makes me excited for peppermint mocha and gingerbread flavors as it gets closer to Christmastime. Can you tell I’m a BIG time holiday lover?? Starting October 1, I’m in heaven for the following 3 months! Lunch today came together quick because I threw together a nice chop salad last night so I wouldn’t be so rushed at noon. 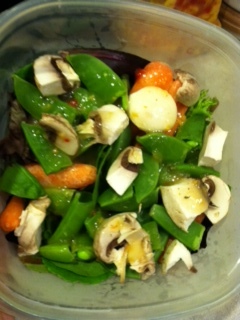 It contained a spinach spring mix, snap peas, carrots, and mushrooms! A little light zesty Italian dressing topped it off. I may have had a few tortilla chips on the side for a salty crunch 🙂 Yum! 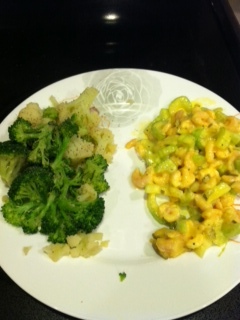 And the rest of my lunch is unpictured because it is boring and not healthy at all! I had a spinach, artichoke, and chicken Lean Pocket for my main meal. It was as delicious and filling as a frozen lunch can be. But, to be honest, it was pretty tasty. I also took a second to cut up a massive apple that has been sitting in my fridge for the past few weeks because it is too big to eat like a normal apple. I don’t think you could’ve bit into this sucker! 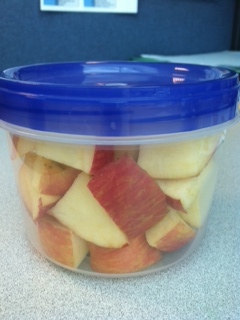 It filled up this 2-cup container and took me about 20 minutes to polish off at my desk this afternoon. A super filling snack to say the least! Dinner started with yogurt. Key Lime pie flavor! 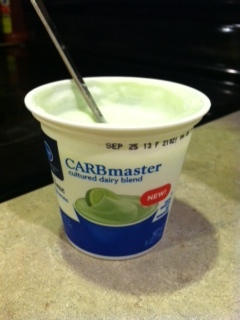 I ate this as soon as I came in the door from my Jazzercise class tonight. I then quickly showered before my main meal: leftover veggies from last night and shrimp salad that I threw together right before I headed off to class tonight. 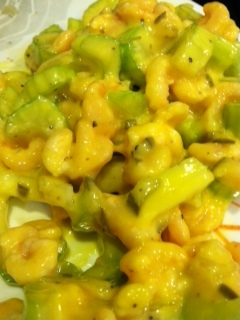 Salad shrimp are one thing I try to always keep in the freezer. 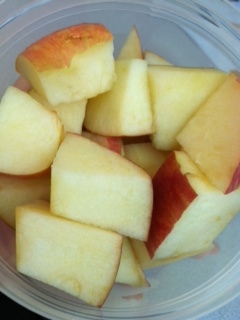 They are yummy; you can toss them into basically anything; and they are a great source of protein! Now I’m headed off to relax so I can wake up early and hopefully get in a good workout at the gym before my Friday workday begins. Sleep tight everyone!